It’s been a season of ups and downs for the Florida State offense, which shows up every game in a different form. It was almost completely responsible for the Georgia Tech and Clemson losses, yet also managed to help win the Louisville and NC State games. One would think that having Dalvin Cook in the backfield would alleviate any issues that an offense could experience. For the most part, that is correct: when Cook is healthy, the offense performs pretty well. That has unfortunately not been the situation many times. Between a hamstring issue and general injuries, Cook has been limited in many contests, causing the offense to sputter out at the worst times. Everett Golson was unable to fill this void when it presented itself. There are many reasons for this (and some debate still persists) but ultimately his lack of downfield passing was the most glaring deficiency. His deep ball often wobbled and his accuracy on it left much to be desired. Statistically, Maguire and Golson are not separated by much. Maguire has a better TD-INT ratio and much lower sack rate, while Golson had better accuracy and more yards per game. It should be noted that some of those numbers are certainly skewed by level of competition. 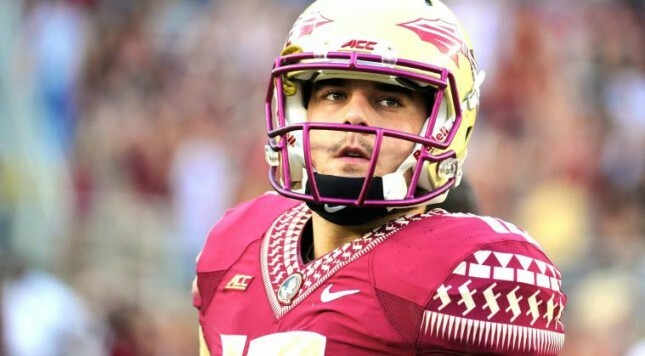 But the FSU offense seems to run more smoothly with Maguire at the helm. It looks like Jimbo opens up the playbook a bit more, or at least Maguire takes advantage of all the options in front of him. Why is this? Why has FSU finished strong after the collapse at Georgia Tech and why does Maguire bring more of a threat to the offense than Golson? The reason seems to be that Maguire takes chances downfield much more often than Golson. See, it has been known since last year that the former had a fantastic deep ball. Fans first got a glimpse of it in the Clemson game when he hit a streaking Rashad Greene for an 80-yard touchdown to tie up the score. His deep ball has a great amount of air under it that let’s it drop right in the hands of his receivers. This point was reiterated in the Spring Game, and further exemplified when Maguire got his first start of the season against Syracuse. While Travis Rudolph ultimately made the highlight what it was, there is no denying that Maguire’s touch on this pass allowed it to happen. Plain and simple, he just has better arm strength and touch on it. Other teams have noticed. Against the Florida Gators in Gainesville, the safeties often stayed back and helped eliminate any opportunity that the Seminoles receivers would have to sneak behind their defense. In this game (which we focused on here) the Gators forced Maguire to hit the short options rather than the home-runs. For a while it really did throw off the Florida State offense–Maguire was missing easy passes and throwing way too hard on short routes. He obviously got better as the game went on, but Florida knew it could not let him try to bomb their secondary. Houston however doesn’t have the talent that Florida does. If the player-by-player gap wasn’t enough, all the advanced stats say that the Cougars aren’t exactly sporting a no fly zone. It is this exact area where observers should expect the FSU offense to attack. When a team has a quarterback like Maguire, it knows the mental effect he can have on a defense. On one hand the Cougars have to try and stop Dalvin Cook, but on the other hand they have to try and limit the big passes against their secondary. It presents a defensive conundrum for a team whose defense has already looked confused enough in the regular season. By trying to push the ball downfield, the Seminoles can open up the running game and let Cook do what he does best. If Maguire can even hit at least half of his deep pass attempts, it will be hard for Houston to stop the offense. Even against one of the best pass defenses in the NCAA (Florida) there were still 3 or 4 plays where an FSU receiver got a huge chunk of yards. One has to expect that there will be more of those plays against Houston. Nobody denies that Cook will be the star of the offense. But Cook can be helped immensely by Maguire capitalizing on a weak pass defense. If need be, he can even carry the load and spark a few big drives. Any way you slice it, Maguire’s performance today will dictate how this offense performs.